I’ve been doing quite a bit of SSIS 2005 lately and I’ve come across a weird problem that almost had the best of me. It’s no secret that I absolutely *hate* Oracle and this problem I just had didn’t make it any better. What I had was a quite long and complex pl/sql query (over 250 lines of code!) 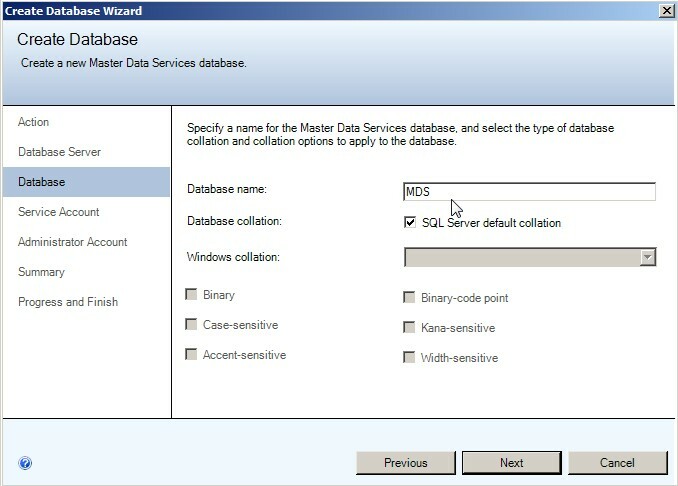 that was running smoothly in sql developer, the Oracle OLE DB provider in SSIS had absolutely no problems with the code when previewing data or mapping the column metadata. But when I saved the package and ran it I got the error message saying “ORA-000938: missing expression”. Sooo…what to do? Obiously there was some kind of syntax error but I have a query that runs perfecty in SQL Developer, it validates without a hitch in SSIS and I can even preview the data in the OLE DB source object in SSIS. Quite amazing to be honest! So, after 7 hours (!! I kid you not!) of debugging this query I had a colleague step in to my office for a few minutes. And then he dropped the bomb: “Did you remove all the comments in your query??”. I just stared back at him in disbelief but at that point I was ready to do just about anything so I tried it and; Voila. The query ran through. After a bit more debugging I learned that it was the “–” (double dash) it didn’t like and that the /* */ works just fine and I think it has something to do with th driver actually removing all the carriage returns in the statement so anything after the first comment is also commented out. Go Oracle! Don’t ever comment your PL/SQL queries in ssis using “–” (double dash), it simply will not work! The script I created for generating a point-in-time restore t-sql code has been updated and the last version should support sql server 2005, 2008 and 2012 versions. that you need to manually execute. Works only on SQL2005 databases!! I was just recently working with a client that was moving a few 100k rows of data on a daily basis from one system to another and all this data was incremental in the sense that the source data was a ticket system and there was an incrementing ID on all the sales records. Now the problem was that for various reasons not all data had been transferred in the past, a few sales records had been deleted because of void transactions (these were not so many), others were simply missing (this was a substantial bunch). All these missing data were amounting to quite a bit of money in the sales reports so I had to find a way to identify and transfer them on a regular basis so that this problem was kept at a bare minimum. 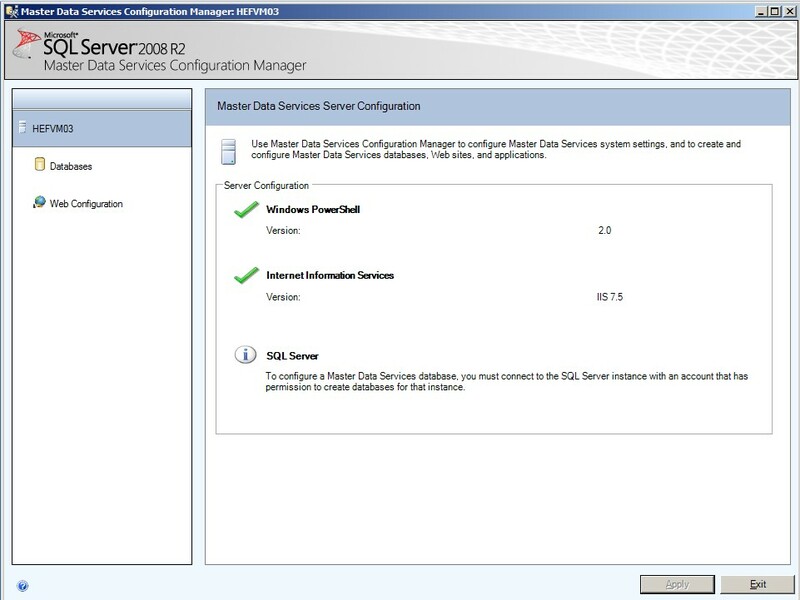 If you open up the SQL 2008 R2 installation media and browse the files on the DVD/ISO you will find a folder there called Master Data Services. You will have to traverse through a few subfolders but the only content once you get to the bottom is an .msi-file called “MasterDataServices.msi”. There is not a whole lot of configuration to be done in the installer, so just run it like any other .msi and wait until it finishes. Then you are asked to specify a service account. 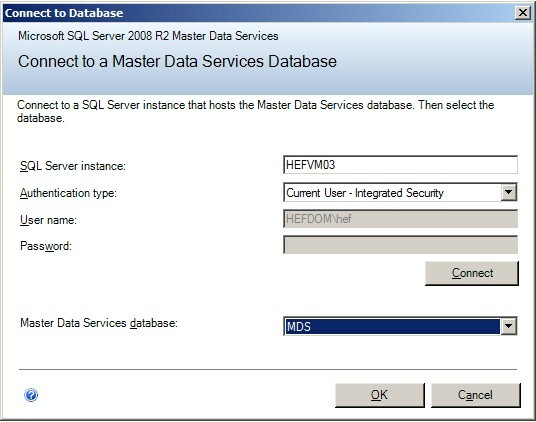 This is an account that the Master Data Services website (Master Data Manager) will use to authenticate with the MDS database. It will have to be a Windows account, either a local one or preferably a domain account. The next page in the wizard tells you to specify the administrator account. And this is very important: The administrator account CAN NOT be changed at a later time! You might get an error if you try to set the new site up to run on port 80 because the Default Web Site already runs on this port. 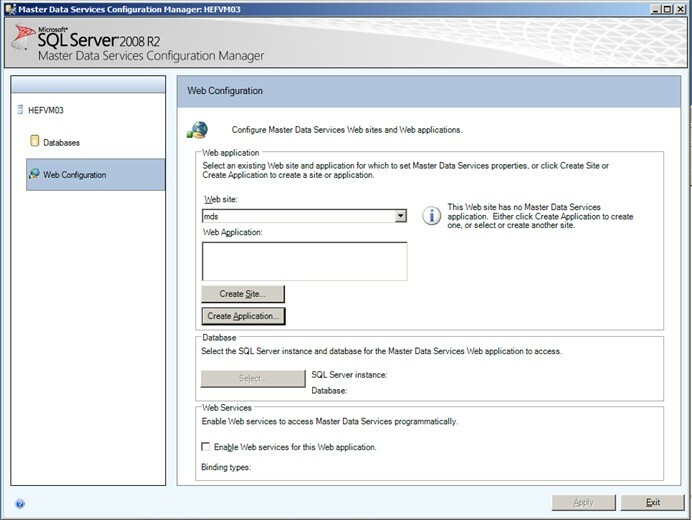 Specify a host header, change the port number or remove the default web site to resolve this issue. 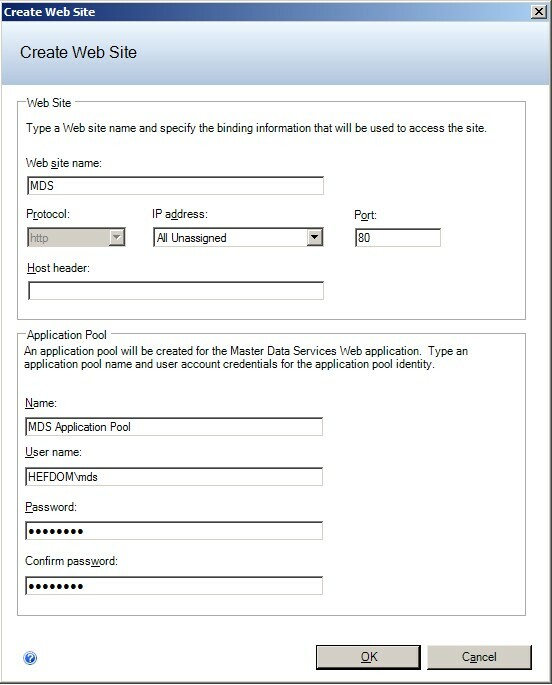 Click OK again and your new Master data Manager website opens up beautifully in the browser on your server.